How would you like to bring the beach to your bathroom? Now you can, with these stunning seashell shower curtains! 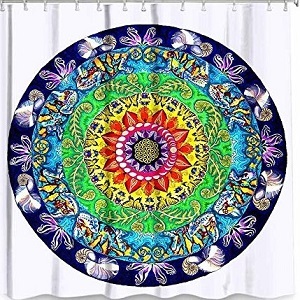 Each one is more beautiful and realistic than the next and every time you go to the bathroom and see your cool seashell shower curtain it will make you feel like you are actually on the beach! Life is beautiful under the sea! This one is so charming! Lime green and turquoise sea shells and fish. Multi-colored flowers, big and small, delightfully decorate the scene, composing a shower curtain that is a stunner! The borders on the big flowers remind me of a Koch snowflake! You know, that captivating fractal curve you can stare into for hours? You step into the bathroom and find yourself…. on the beach!! *This picture was taken from my own seashell collection… I just love them! Add to your seaside bathroom collection with this artistic piece! 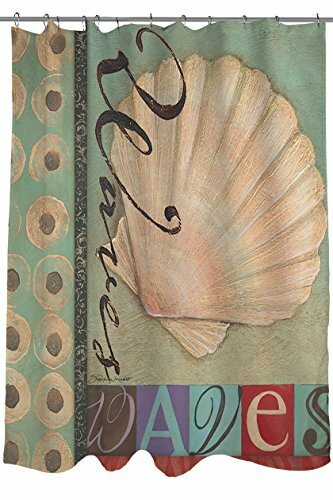 Shells, choral, starfish and seahorses against a background of art and poetry. Notice the purple jelly fish and star fish? Purple makes everything better, don’t you think? If you want to complete the look, check out these awesome seashell shaped decorative hooks! 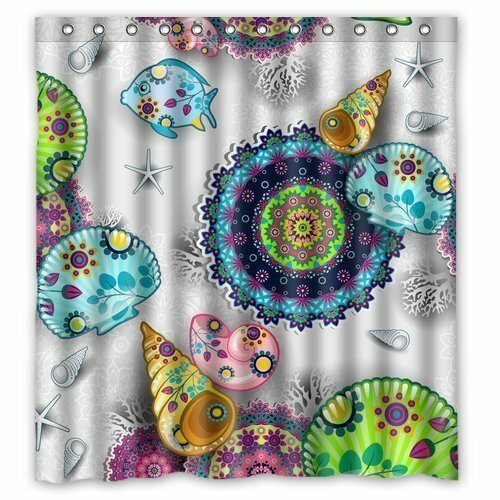 Fun and Pretty Sea Shell Beach Shower Curtain! What can be more fun than picking colorful sea shells on the sand? 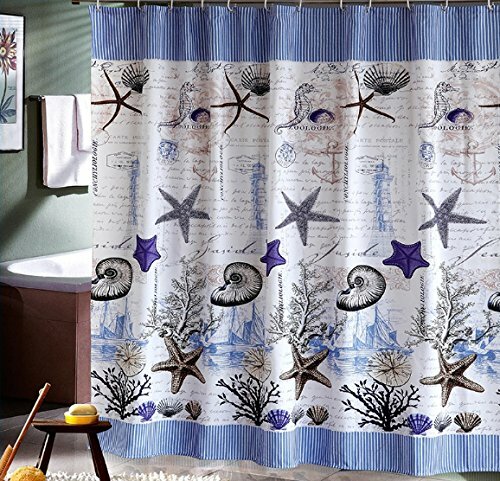 Having a pretty sea shell shower curtain in your bathroom! Vibrant and artistic bathroom accent! 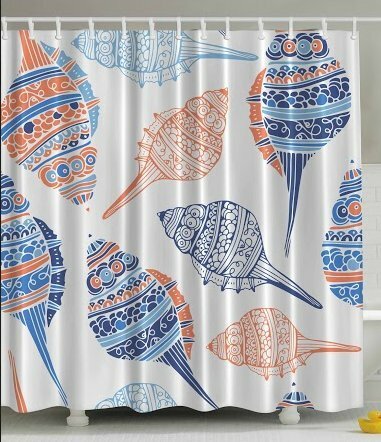 Orange and blue sea shells shower curtain = dip your toes in the salt water all year round! What I love about this design is that it full of details, without overdoing it. Two basic colors, assorted shades of orange and blue, with plenty of white space. Perfectly complements other beach-themed accessories for a laid-back Summer look. The water’s great, come on in! This one is the whole deal! 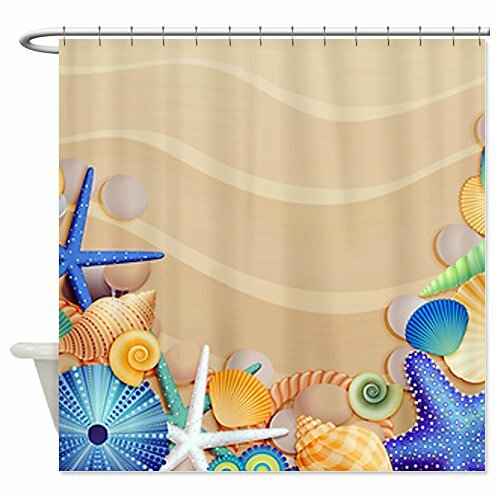 Beautiful seashells on the beach shower curtain! Sea shells, corals and marine life form an elegant patchwork in teal, creme, and brown in grunge print style. The center patch is a light burgundy with the word Seashells, and the tongue-twister “she sells seashells” right underneath. 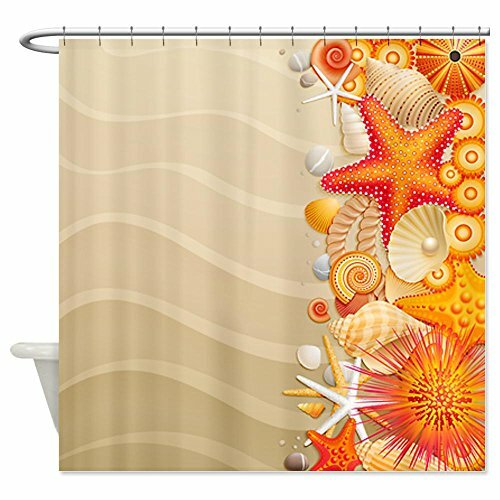 How can you choose only one when each seashell shower curtain for sale is more beautiful than the next? Well, good for you you have two bathrooms! 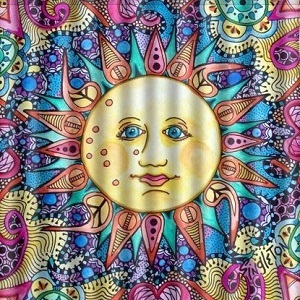 This one for example is bright and fun! Will go amazing in a beige bathroom! The orange seashells will stand out! 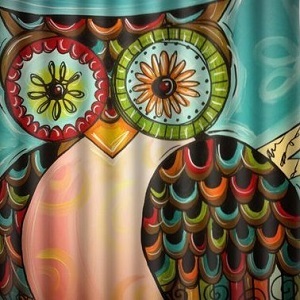 How about a shower curtain that you can personalize with your own name? Or someone else’s, to give as a gift? Conches, fan shells, horn shells, starfish and sea horses decorate the vibrant, colorful design that you choose! Pick from 45 colors (I’m very partial to the lavender choice displayed here, though!) I’m sure you’ll find your favorite color among them! 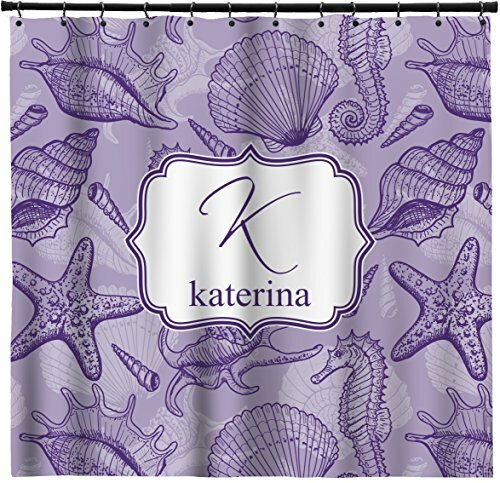 The Most Gorgeous Seashells Shower Curtain for Sale! 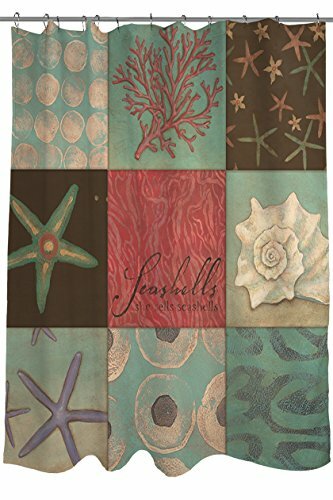 This is my favorite seashells shower curtain for sale around! I LOVE the gorgeous large seashells! They are the ones that are very hard to find when we go to the beach! It will look stunning in an all-white bathroom! The sea shells will pop out! *Now if you really want to go to the beach in your bathroom all the way, then pair it up with this gorgeous Seashell Pattern Toilet Seat too! 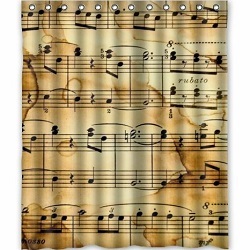 Another beautiful grunge style, pastel-colored curtain by Thumbprintz. Here you have a large fan shell and the word “WAVES”, printed vertically and also on the bottom, each letter a different color. Aren’t these all gorgeous? 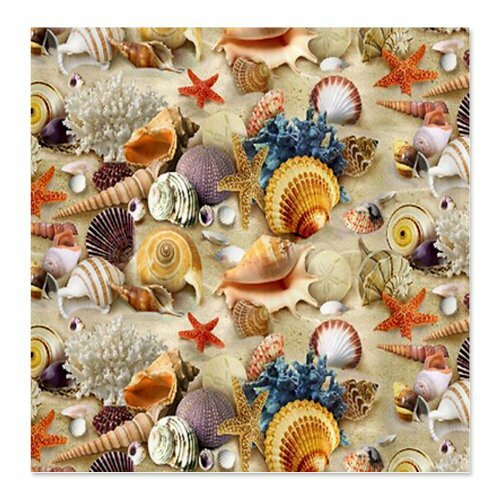 I hope we have helped you pick the decorative seashell shower curtain you were looking for! Maybe we’ve tagged what you’re looking for? CoolBathroomDecor.com wishes to disclose that it is a participant in the Amazon Services LLC Associates Program, an affiliate advertising program designed to provide a means for sites to earn advertising fees by advertising and linking to amazon.com. *We are also designer associates at Zazzle.com and as such, receive compensation for sales that are generated by our affiliate links.